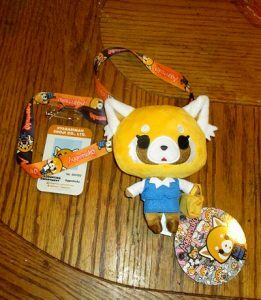 I received a Sanrio gift card form my sister and bought and Aggretsuko plush. 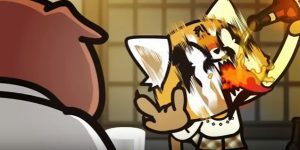 Aggretsuko or Aggressive Retsuko is an adorable anthropomorphic Red Panda created by Sanrio, the same company that brought us cute characters like Hello Kitty, My Melody and Chococat. Sanrio created Aggretsuko in 2015 and was part series of shorts steamed on Sanrio’s Japanese YouTube channel and now released as an Anime on Netflix. Aggretsuko is a 25-year-old single female office worker, Scorpio, Blood type A. She tries to survive her oppressive job in the accounting apartment, with an incompetent and chauvinist boss hog named Ton. Ton often ridicules and harasses her. In addition, Aggretsuko has to deal with other bothersome situations and coworkers, a gossipmonger, and brownnoser. She has a twisted secret side to her; she blows off steam cause by her job and coworkers with Death Metal Karaoke. The show deals with less cute and more about such the plight of Japanese Office ladies, sexism and being a corporate drone. In a way, it the cartoon is Japanese cross between Office Space and Dilbert. While the show deals with Japanese work culture, one does not need to be Japanese or a female to identify with Aggretsuko’s plight. Many commentators, media reviewers, and fans have given the show glowing revues. Aggretsuko and Gudetama, a lazy and lethargic egg, adult like behavior branches from the child like kawaiiness of Hello Kitty and other Sanrio charters. 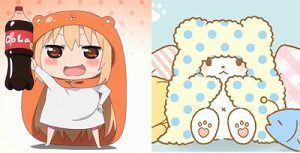 Sanrio is sending a strong message they want to appeal to adult male and female market and not just with Hello Kitty. Akab News 1 Apr 2018. 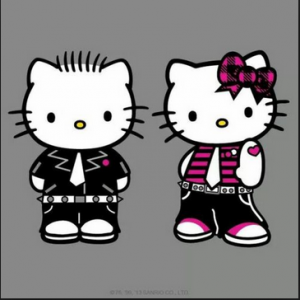 Don’t call Hello Kitty a Girl. Sanrio announces release of Gender Fluid and Gender Neutral collaboration. The initial release will feature Hello Kitty. “It is a known fact Hello Kitty does not have a mouth because they want people to “project their feelings onto the character” and “be happy or sad together with Hello Kitty. We are taking the next step in allow people to self identify Hello Kitty’s gender in a wide range of the gender spectrums. We are appealing to today gender reality and sensitivity. “, quote a spokes person for Sanrio. Most LGBT activist approve of Sanrio bold move while a few Gay and lesbian and feminist groups criticize about pandering to “That group”. Gender Neutral releases of other characters including Batz Maru, My Melody will follow. SANRIO, best known for global icon Hello Kitty® and home to many more endearing characters including Chococat®, My Melody®, and Keroppi®, is celebrating its 50th Anniversary this year. August 2010 marks the golden anniversary for the worldwide lifestyle brand that was founded on the “small gift, big smile®” philosophy – that a small gift can bring a big smile to people of all ages. Today, over 50,000 Sanrio-branded items are sold in over 70 countries around the world, please visit www.sanrio.com.